Giveaway: Win a $100 or $40 Pet Store Shopping Spree! Splurge on your fur kid with a shopping spree at their favorite pet store! This giveaway has TWO Lucky Winners! The first place winner will receive a $100 Gift Certificate to the Pet Store of their Choice and the second place winner will receive $40 to spend at their favorite pet store (Petco, PetSmart, Pet Supermarket, etc). Two Little Cavaliers, the popular blog for International Dog News, tips on Cooking for Dogs, and the creator and co-host of the Saturday Pet Bloggers Blog Hop is hosting this Giveaway to celebrate friends and fans, and the pets who love them! Disclosure: I have not been compensated for this post and all opinions are my own. Woof Woof Mama is not responsible for sponsor prize shipment or delivery. Want more pet giveaways? 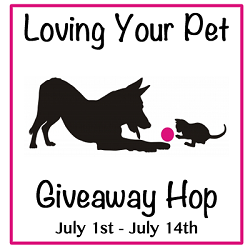 Mark your calendar for the Loving Your Pet Giveaway Hop starting July 1st! All prizes are for pets and pet-related! If you are a blogger, there’s still time to sign up to join the fun! We have 5 cats but if the right dog showed up we wouldn’t turn him away. Dumpling is our shih tzu mix dog that we adopted in January. I have a Basenji/Min Pin mix named Mac. I have two cats; but lots of doggie friends! My performance bostons would go crazy for some new toys! I have 1 incredible Cavalier King Charles Spaniel – who would be totally spoiled by this win! A pomchi, six kittens (looking for homes) and, two older cat. I have lots of pets but pets that would play with toys would be my amazing dog Coco. SHe is a rescue dog. A 4 year old Pit Bull who was not wanted by her owners anymore. She is allergic to many many things and can only have one brand of dog food. This mixed with being a pit bull noone really wants to adopt her. so we took her in(we foster) and kept her. Best dog we have ever owned! She loves squeaky toys and playing fetch and she is just the best dog Id love to shower her in toys and gifts to show how much she is loved. My 1 year old has some health issues that doctors have not diagnosed and her and coco are the best friends! She and her go everywhere together and when she is sad she doesnt cry for mama or dada she cries for coco. sorry rant but we love this dog. she is amazing! OH and watching her wrestle and headbutt the goats back is just halarious! I have a dog and a Parakeet. I have two mix breed rescue dogs Kouga and Artie. We have 2 cats– a 14-yr. old Tortie, who is almost totally blind, and beat the odds of survival after a stroke over a year ago; a 4 yr. old black & white, who is my hubby’s “buddy;” and our Border Collie-Pit Bull rescue, age 3, who I’m training to be my service dog. This will be the second service dog I’ve trained, and the other was a rescue as well. I have two dogs! One is a border collie mix and a service dog, and the other is a Papillon. We have a wonderful rescued mutt and she’s the love of our lives. I have 2 big labs. 2 not so mangey mutts.